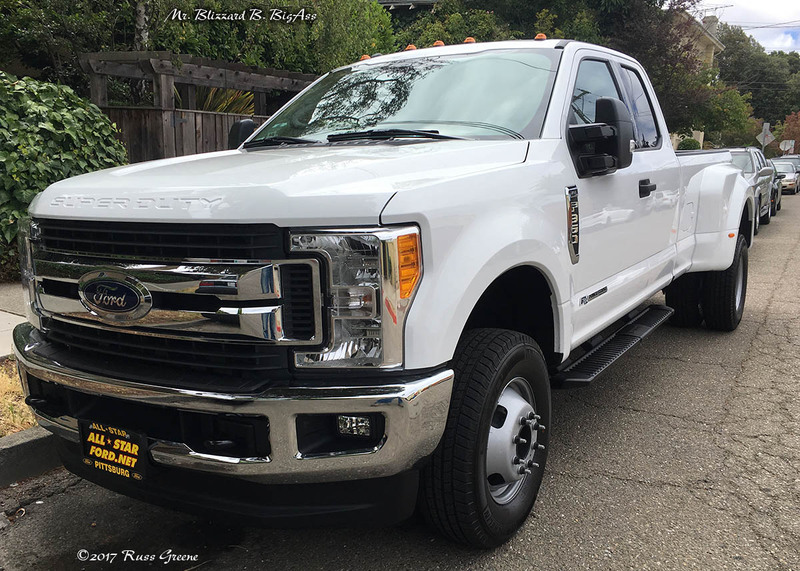 Mr. BigAss B. Blizzard (don’t ask me what the B. stands for–I forgot), my 2017 Ford F350, 6.7 liter Powerstroke diesel, dual rear wheel, 4×4, pickup truck. In the first three parts of this article my energies were focused on providing readers with information about finding the best deal possible on a new vehicle, in particular when ordering one from the factory. Part One was on the basic principles. In Part Two I wrote about helpful web sites, collecting price information and going or not going to dealerships. Part Three addresses the right and wrong people to talk to–who to deal with and who will waste your time–and how to request a price bid. There are better and worse ways of doing these things and I gave voice to my thoughts about them. Here in Part Four, the final installment of this article, I expand on my previous remarks about titles given to dealership personnel, I’ll have some things to say about the dealers with whom I interacted along the way, relating my experiences with each (negative and positive alike, mostly negative–surprise, surprise). I will also write about my final moments at the dealership where I made my purchase and how things almost fell apart, hoping that by doing so it will help equip you toward avoiding similar scenarios. For good measure I’ll toss in something counterintuitive about how financing may in some cases actually save you money, if handled properly. For openers, I am pleased to report that my deal is done. As I write this my new truck, Mr. Blizzard B. BigAss, is happily parked out front. He came home with me the day before I began writing this page. All Star Ford in Pittsburg California was the dealer I did business with and Viva Velez was the sales rep. She bears the title Master Certified Internet Sales Manager (more on that next paragraph). My experience with this dealership was largely positive: I felt no pressure and sensed no trickery; Viva seemed genuinely concerned that I was happy with everything. I have no reservations about giving All Star Ford and Viva a thumbs-up. Earlier I wrote about titles that may appear alongside names on dealership web pages (and I should add on business cards) and how those titles may be inventions of the dealerships and reflect nothing meaningful, or worse, deception. I also wrote that General Motors has a certification program for Internet sales representatives and that the title of Certified Internet Manager meant that somebody had met GM’s criteria for that title which includes a course of ongoing study and testing regarding product knowledge. As it turns out, Ford also has a program like that and the sales rep I did business with, Viva Velez, is certified by Ford as a Master Certified Internet Sales manager. Initially I thought that the Certified titles issued by Ford and Chevy held those individuals to higher standards of conduct than other employees of GM or Ford, but later I found this not to be true. Makes sense–how could one group of employees be expected to be 100% above board, polite, helpful, etc. whereas others get to skate? I can say from personal experience that Viva Velez seemed above board and concerned with my experience all the way from providing the initial quote to shaking my hand as I drove off with my new truck. I can also say there was never any pressure at All Star Ford–they didn’t try to sell me any extra services or products or push me into financing (which for auto dealerships represents a significant profit center.) Incidentally, I have no affiliation with Viva Velez or All Star Ford other than having purchased a vehicle there. I got a phone call from my dealer that my truck had been delivered sooner than expected. That call came about a week before I started writing this page. With my sales rep taking a couple days off, me needing time to move some funds around to have them ready for the transaction, we set up a time a few days later on a Saturday to finalize the deal. Good thing we did it on a Saturday because after I got home I decided I wanted to change the particulars of the financing. Being a Saturday the dealership had nothing they could do with my check except hold it in their safe until Monday, so the next day, Sunday, before they had a chance to cash my check I went back to the dealership and we rewrote the paperwork. Everyone knows that taking out a loan and paying interest on the money borrowed costs more in the end than paying cash up front. So how is it possible to reduce one’s cost when purchasing an automobile by financing instead of making an outright purchase? How can you do that? In my case several things came together which all told would net me about $650 for financing instead of paying cash at the time of purchase: first, I had enough cash to buy the vehicle for cash if I wanted; second, Ford was offering $750 Cash Back for financing with them; third, there was no pre-payment penalty for paying off the loan early; fourth I could borrow as little as $7500 to get the bonus. I had originally planned on a cash purchase but I thought if there was some way to finance, get that $750 then prepay the loan balance before I had paid $750 in interest it would be to my financial advantage. I checked to see if there were any prepayment penalties. Ford say there weren’t. Technically, that meant I could take out a loan with Ford, get the $750 incentive and pay off the loan the next day thereby paying one day’s interest and keeping the balance of the $750. I was advised, however, if I tried to pull a stunt like that Ford would disallow the $750 Financing Cash Back. It was suggested I wait a couple payments before paying off the loan if that’s what I chose to do. When I first looked at the numbers I found that the interest I would pay in 2-3 months would pretty much wipe out the $750 incentive, but I was using a loan amount of $50,000. Then I realized I could save some interest expense by financing a lesser amount. I asked my dealer how much the minimum loan amount was in order to qualify for the $750 bonus and was told $7500. Interest payments on $7500 would be in the neighborhood of $30 a month. I realized I could finance $7500, make three monthly payments and then sometime in the 4th month pay off the loan in full. The net result would be to get the $750 bonus and sacrifice about $100 of that to interest payments leaving me with about $650 of that $750. Generally speaking, financing increases one’s total costs but there are exceptions such as the one I described above that can actually save you some moolah if you’re thoughtfully looking for them. Upon arriving at the dealership I sat down with Viva to go over the numbers and sign the papers. At this juncture things seemed as if they were starting to go wrong. Paperwork was being placed in front of me with terms I didn’t understand, numbers that didn’t make sense to me with pricing that seemed too high and nothing Viva or All Stars’ finance man said to me helped me understand what I was looking at. I couldn’t tell if they were trying to pull a fast one at the last minute–that moment in time where customers are often in a mental fog, nervous about spending a lot of money, looking at paperwork with terms they don’t fully understand, and most likely to make a mistake that costs them. In my case there was the added element of me being someone who is distrustful of car dealers and being distracted by a finance guy who was talking about guitars, music, his old truck, etc. while I’m in the midst of signing one of the most important deals of my life. The deal was going south, and fast. I could not get to the point of understanding the financing numbers so I told them rewrite the deal for cash as I had originally planned. I wrote a check and drove home in my new truck. Later I spent a good long while looking at the numbers on the paperwork that I didn’t sign, the papers for the financed deal. I finally figured them out, on my own, and they were fine. There were no shenanigans on the part of the dealership, only, as was said in the movie Cool Hand Luke with Paul Newman, “a failure to communicate”. I contacted All Star the next day, rearranged to rewrite the deal again financing $7500 of the purchase, got my $750 cash back and drove off into the sunset. Previously I said Part Four would be the last part of this article and while this installment seems long enough already I haven’t yet gotten to writing about the dealers I contacted, how those interactions went, which dealers behaved idiotically and which seemed OK. In order to keep this page from growing too much longer I am going to link to my Ford and Chevy dealer experiences/recommendations on a separate page, here. This information will be of most interest to people shopping for Fords or Chevys in California and then mostly in the San Francisco Bay Area. I have separated my notes about the dealers I dealt with from the main body of this article because that information will likely be of use only to people in my geographic location. See Dealer Notes, below. I hope that my this series of articles, now complete, will be of some assistance to people shopping for new vehicles, something that many RVers (and others) will do from time to time. Salespeople at automobile dealerships, IMHO, often seem to be there out of desperation–not being able to find a better job, a job that requires skills or education. Many are quite young. They often seem to have little understanding of the product. Likewise, they often seem less interested in what you want than selling you what they have. After having contact with more than a few automobile sales reps it became apparent that many sales reps have been instructed to get you into the dealership; that this is the most important thing to do above all else because they have much more control of the sales process and a higher success rate in terms of closing deals. I found that much of the time I was doing business with somebody that either didn’t know their product, would say anything they thought I wanted to hear in order to sell me, ignored questions I sent via email, failed to follow-up with information they promised to deliver, tried to sell me a vehicle I didn’t want simply because they had it on the lot, tried to get me into the dealership even though I made it very clear I didn’t want them to, etc., etc… In other words, in general, don’t expect much of anything good from automobile sales people. That said, there are exceptions. When I began reaching out to auto dealerships I wasn’t aware of the consequences of using their web-form Contact Us web pages and had not yet figured out that using their web-form email pages was a mistake. Consequently I was forced to endure a barrage of idiotic, often poorly formatted canned email responses that ignored what I had written, made no sense in the context of what I had written or both. Of the dealers that did respond to me, more than a few of them responded to my web-form email by sending improperly completed form letters which showed a lack of attention to detail and/or a mismanaging of their email systems. Others tried to sell me vehicles in which I had no interest just because they wanted to sell what they had, not what I wanted. I regard all this as terrible public relations. In many (if not all) cases where I filled out a web-form email I found myself on a promotional mailing list from which I then had to unsubscribe. Of the 35 Chevy dealers I contacted only eight of them offered me bids and one of those I regard as completely bogus. I wondered why I heard back from so few and I can think of several possible reasons: 1) they could tell they weren’t going to make much dealing with me, 2) they didn’t get my email, 3) I didn’t get their email, 4) they mismanaged my email and lost track of the situation. I like to think that it was mostly #1, they knew it would be hard to make much dealing with me, but I may just be flattering myself. One of the Chevy dealers stood out above the rest, Home Motors, and the rep I dealt with is responsible for that–Bobby Tamayo. One dealer sank abysmally to the bottom, FH Daily and the rep responsible for that was Dennis Hallam. For what it’s worth, at the time of this writing FH Dailey had a D- rating on the Better Business Bureau web site. Click HERE for a PDF file of Chevy dealers I contacted and my notes about them: whether or not they provided price bids, what their bids were, if they wasted my time and whether I would recommend them or not. By the time I began reaching out to Ford dealerships I had finished my dealings with the Chevy shops and had also dropped the practice of using dealer web-form email pages in favor of personal email addresses of people with final authority over sales. This gives me more confidence in believing that my emails got to the right people and dealers that didn’t bid did so because they didn’t see a big enough profit on the horizon. The Ford dealership with which I eventually did business was All Star Ford. Two other dealers matched their bid but All Star was the closest to my location. I can’t offer any real complaints about dealing with them. There was no pressure. They tried to be helpful. They delivered on their price with no shenanigans. While they weren’t perfect, if grading on the curve they’d be at the top. One dealer, James Ford, tried to convince me that All Star could not possibly sell me the truck for so little because they would be losing money on it. I was warned “Let’s see how happy you are after delivery…When things seem to good to be true…There is not $2k profit behind invoice”. I reported back to James Ford after the deal with All Star was consummated that All Star had in fact delivered as promised. The reply I received from James Ford was, in part, “You found someone who made a mistake and hoped a program would come along to bail him out and it did not happen.” Can he be believed? Dunno. Click HERE for a PDF file of Chevy dealers I contacted and my notes about them: whether or not they provided price bids, what their bids were, if they wasted my time and whether I would recommend them or not.